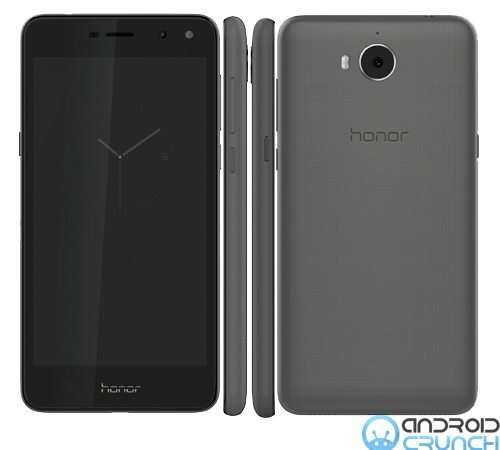 Huawei is all set to launch the new Honor series device Honor 6 Play next month in China which will be the successor to the Honor 5 Play launched in 2015. The device has already received the TENAA approval few days back with model number MYA-AL10 revealing the images and specifications of the device. 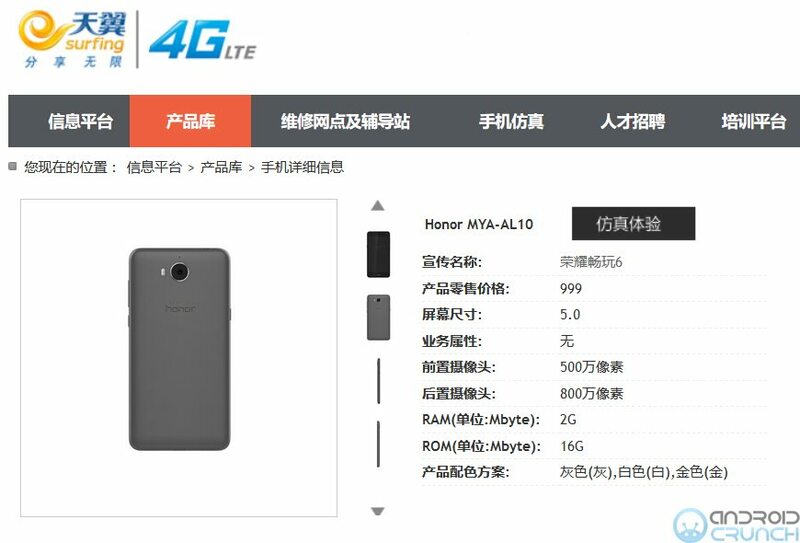 The device is now spotted listed by the Chinese carrier China telecom on their website in the devices segment and the listing has also confirmed that the Honor Play 6 will be launched on September 12 in China. The device will carry a price tag of 999 Yuan (around $152) according to the listing and will be available with Gray, White and Gold color options. 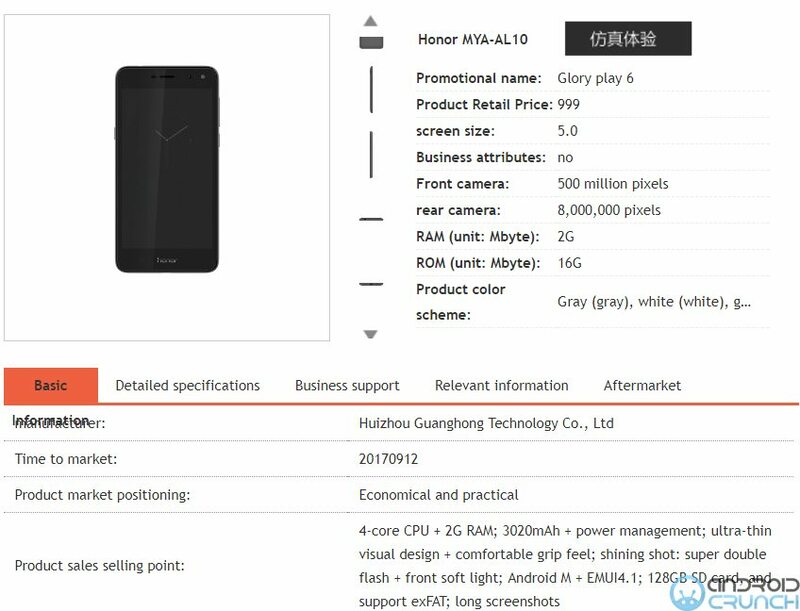 The leaked listing from China Telecom website confirms that the Honor 6 Play or Honor Play 6 have the same features like we saw in its TENAA listing. It comes with a plastic body and features a 5-inch HD display with 720×1280 pixels resolution. It is powered by a 1.4GHz quad-core Mediatek MT6737T processor with Mali-T720 GPU along with 2GB of RAM and 16GB of internal storage which can be further expandable up to 128GB via microSD card slot. It runs on Android 6.0 Marshmallow operating system out of the box with the company's EMUI 4.1 on top and will support Dual-SIMs as well. It supports an 8-megapixel rear camera with dual-tone LED flash and a 5-megapixel front-facing camera with soft flash for selfies lovers. The smartphone is backed up by a 3020mAh battery and connectivity options of the smartphone include 4G LTE with VoLTE, Bluetooth, WiFi, GPS/A-GPS, a micro USB 2.0HS port, a 3.5mm. headphone jack and it also supports FM Radio. The device also comes with Gravity sensor, distance sensor, light sensors but doesn't have the fingerprint scanner. The device measures 143.5 x 72.2 x 8.85 mm and weighs 145 grams. It comes with three different colours that includes Gray, Gold, and White. To recall, Huawei launched the Honor 9 smartphone in June with a 5.15-inch Full HD 2.5D curved glass display, octa-core Huawei Kirin 960 (4 x 2.4 GHz A73+ 4 x 1.8 GHz A53) processor that also comes with i6 co-processor and Mali G71 octa-core GPU, 4GB RAM + 64GB inbuilt storage and 6GB RAM + 64GB / 128GB inbuilt storage options, supports MicroSD card expandable storage up to 256GB storage, the Android 7.0 Nougat OS with EMUI 5.1 and comes with Hybird Dual SIMs support. Other specs includes a dual rear camera with a 20-megapixel (Monochrome) + 12-megapixel (RGB) cameras with dual-tone LED flash, Laser AF, PDAF, CAF, f/2.2 aperture and 4K video recording, an 8-megapixel front-facing camera with f/2.0 aperture, a 3200mAh battery with fast charging, a fingerprint sensor on the front facing physical home button and connectivity options includes 4G VoLTE, WiFi 802.11a/b/g/n/ac (2.4GHz/5GHz), Bluetooth 4.2 LE, GPS/Glonass, NFC, 3.5mm headphone jack and a USB Type-C port. It measures 147.3 × 70.9 × 7.45mm and weights 155 grams.